The EU/IMF/ECB troika wants Greece to accept more austerity, including cutting 150,000 public sector jobs by 2015 and cutting minimum wages in the private sector by 22 per cent. The IMF sees the Greek economy contracting by 4 to 5 per cent this year. 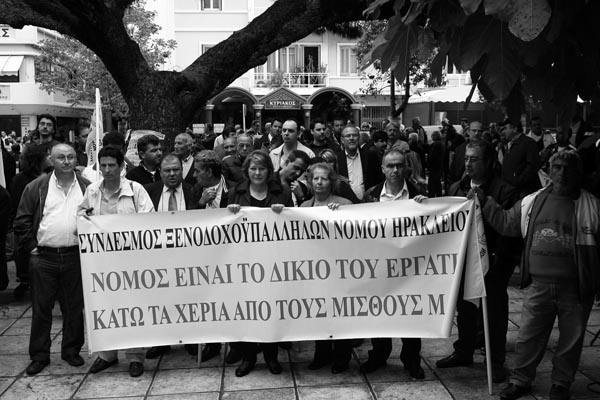 Union of Hotel Workers members demonstrating in Heraklion, Crete against the Greek government’s austerity measures. The banner reads 'Hands Off Our Wages'. In Greece, more than a fifth of workers are unemployed, and nearly half all people under 25 are out of work. The Greek private sector has shed 500,000 jobs in the last three years. Tax revenues are down 7 per cent over the last year. Hedge funds used credit default swaps (CDSs) to short-sell Greek bonds, placing both the Greek government and the euro under stress. Meanwhile Jacques Santer, the head of the European Commission when it was forced to resign en masse over a corruption scandal, is to head a Special Purpose Investment Vehicle, with the apt acronym SPIV, as part of the eurozone bailout fund.